Diabetes in Cats. Monitoring feline diabetes at home. The key to treating a diabetic cat is consistency. Consistency in food eaten, consistency in amount of water they drink, consistency in exercise, the same insulin injections at the same time every day. I keep these records to see just how consistent we are! Every day I write down how much food was eaten. As my cats have both dry biscuits and tinned food, I make a note of both quantities. Over time you will notice trends. As day to day amounts can seem to vary a great deal, the overall picture can be quite illuminating and you’ll probably notice like me that your cat is actually regulating its own food intake pretty well. I also jot down any treats they may have had, whether they were with or without my permission! Sudden changes in the amount eaten, either up or down could indicate that your cat is unwell, or that your insulin isn’t working, or that your cat needs more insulin or less insulin. I also noticed that my cats eat less in summer, which meant that they needed less insulin. They also eat less during times they find stressful, particularly around November 5 when there’s lots of fireworks going off all the time. The sooner those damn things are banned the better. Particularly with Paris who wasn’t diabetic every day, I note down whether an injection was given, and how much insulin was given. No matter how good my record keeping is though, it didn’t stop me arriving at work one day to find a full needle in my pocket! Dammit! Sometimes it’s been necessary to skip injections and that’s noted too. I also make a note of any blood sugar readings I take. I don’t actually weigh the water, but as I refresh the water dish I note how low down it’s gone since the last refill. Again, as this is a regular change each evening, I can see that approximately the same amount of water is being drunk during the course of the day. 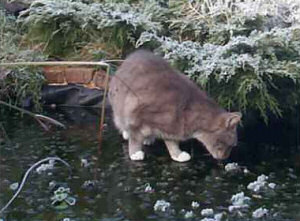 Unfortunately as the picture above shows I have no way of measuring how much pond water they drink! If the quantity they are drinking changes dramatically, it could indicate a problem – your previously well regulated diabetic could have come unstuck, or your cat could be unwell. They drink more during the warmer months as you would expect. I read somewhere that a cat will drink about 200ml per day – although the report stressed that this varies greatly from cat to cat. Coming from semi-desert ancestors cats can get by on very little water. I also have no way of knowing how much water they are getting from the tinned food that they eat. Crucially, how does your cat seem? Are they happy? Are they doing their normal cat things? Do you have the normal interaction with your cat? No amount of monitoring and checking should overlook this simple point – how is your cat in himself? If they seem normal or subdued, or whatever, I make a little note to that effect. 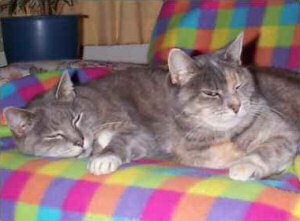 Tatty is an unregulated diabetic with kidney failure. Her blood glucose readings are virtually always high (certainly higher than I would like them to be) But she’s happy. She’s content, eats well, drinks well, inspects the garden when she thinks it’s warm enough, drinks wild water from the pond, watches TV (!) does all her normal things. She asks for cuddles or ignores me, depending on how she feels. So in herself, she’s fine and doesn’t know she’s ill. That’s what’s important. So far I’ve told you how I monitor what goes in – so you know what comes next! Yup! A record of what comes out! But don’t worry, nothing in this category actually gets weighed or measured! As Tatty is prone to cystitis I have recently started writing down how often she goes to the litter tray. It’s highly unscientific because if she’s been to the loo by the time I get home from work, I can only note that she has had a pee, not when she did it. But it does mean that I can say that she tiddled (for example) four times yesterday at spaced out intervals during the day. When she’s been heading for a cystitis attack, the peeing becomes a lot more frequent and I know we’ve got trouble ahead. If I do a urine dip with a Ketodiastix I also make a note of that – something like “ketones negative, sugar 1%” or some such. As for solid waste, all I record is "big poo" or "little poo" or "runny poo" or something to that effect - note the technical terms in use there! Again it’s just for reassurance that she’s pretty regular and her insides seem to be functioning quite well. I also note what supplements the cat had (in Tatty’s case, Slippery Elm Tablet and three drops of cranberry extract and for Paris his methylcobalamin tablets) whether they had any antibiotics or other drugs. I jot down whether they threw up at all, and (yuk) whether it was just spit and grass or whether it was partially digested food. I note whether we’ve been to the vets that day, as that can radically throw out the normal routine for a couple of days thereafter, and if there’s been an operation or an injection of something other than insulin that gets noted too. When I first started making notes I tended to write down every single little thing – I now tend to just jot down the things that are out of the ordinary, like throwing up. A lot of days, other than noting food intake and insulin shots, I make no comments at all because life was just poodling along as it should. You may think this all sounds like one helluva lot of work, but it’s actually not at all. If you take out the care that you would give to a non-diabetic cat anyway (for example the feeding, tray cleaning, refreshing water etc) the extra input required from me is negligible. I can honestly say that this noting down of things doesn’t even add five minutes to my day.